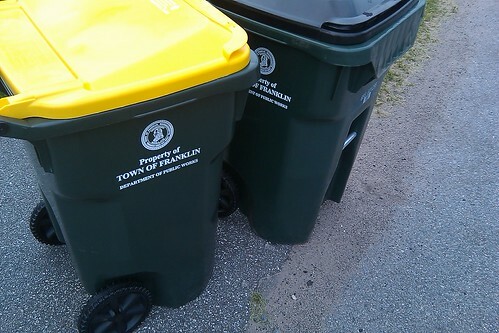 The Town of Franklin provides residents a comprehensive program designed to encourage recycling, reduce materials headed to the landfill, and ensure that all waste is disposed of in an environmentally responsible manner. The Waste and Recylcing Guide includes updated information regarding the various waste and recycling services available to residents through Waste Management. We look forward to keeping the Town of Franklin clean and green! Trash and recycling are collected once every week. All materials must be placed at the curb by 7:00 a.m. on your collection day. A 2017-2018 Collection Schedule is included in this guide for your convenience. • All regular household refuse must be bagged and placed in the green cart with the black lid for collection. • Material may not be sticking out of the cart and lid must be fully closed. • Do NOT place recyclables in the green cart with the black lid. • Dirt, sod, yard waste, concrete or rock. • Household hazardous waste that includes fluorescent lamps, appliances and TV's. • Hot ashes or flammable materials such as oil, gas or paint. Did you know you can also use the Recyclopedia?